Preheat oven to 400 degrees F. Brush a baking dish with olive oil. 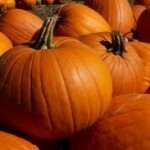 Place pumpkin in a steamer over 1 inch of boiling water, and cover. Cook until tender but still firm. Transfer pumpkin to baking dish, and brush with oil. Season with salt and pepper. Bake in preheated oven until golden brown. Meanwhile, heat olive oil in a saucepan. Cook onion and garlic until tender. Stir in rice, and cook for 1 to 2 minutes. Slowly add vegetable broth 1/2 cup at a time, stirring frequently and allowing all the liquid to be absorbed before adding more broth. Continue cooking until the rice is tender to the tooth, and then season with salt and pepper to taste. When the pumpkin is almost done, place feta on a baking sheet, and bake in preheated oven until the cheese is hot, and is beginning to melt along the edges. Mash 1/2 of the pumpkin, and stir into the risotto with the spinach. Ladle risotto into bowls, and top with remaining pumpkin cubes and heated feta.